The old ways of capturing tumor cells left much to be desired. For cancer centers, the best option was often a tissue biopsy, however painful, however risky. Alternatively, a cancer center might try working with a blood sample, even though conventional technology for capturing circulating tumor cells (CTCs) was limited. It isolated only those CTCs that expressed epithelial biomarkers. Vortex Biosciences is reframing cancer diagnostics with a fully automated, label-free technology to extract CTCs from whole blood samples. This technology, embodied in Vortex’s VTX-1 Liquid Biopsy System, minimizes cancer centers’ need for tissue biopsies, and can be developed for early cancer diagnosis, therapeutic selection, cancer status monitoring, or as a prognostic indicator for cancer therapeutics. The VTX-1 technology is built upon the liquid biopsies that entered the diagnostic scene a few years ago. “The older CTC technology didn’t do a good job of isolating the CTCs,” Steve Crouse, chief commercial officer, Vortex Biosciences, points out. The problem was that the capture technology used antibodies to bind epithelial biomarkers expressed on the surface of the CTCs, but only a select population of circulating cells express the particular biomarkers. Collection, therefore, was inefficient. In contrast, “We isolate the CTCs based on their physical properties, such as size and shape,” Crouse says. Because the properties Vortex selects are unique to tumor cells, recovery rates for CTCs are higher than for older technologies. Crouse maintains that a 60–70% recovery rate is typical for the VTX-1 system. The isolation process is based on fluidics. “We flow the blood sample down microchannels, which widen to reservoirs. Just like in a river, you get eddies—vortices—near the edges. The CTCs, which are larger than red or white blood cells, are captured in these vortices while the blood cells flow past. We then stop the flow through the channels. Doing so collapses the vortices and releases the CTCs,” Crouse explains. Cell purity is high enough for the recovered CTCs to go directly into analysis. Crouse says less than 80 white blood cells (contaminants) are captured per mL of blood processed. With this level of CTC enrichment, targeted mutation analysis on the collected population of cells is possible using polymerase chain reaction techniques or next-generation sequencing. The cells are collected directly from the chip into an Eppendorf tube, Petri dish, or slide chamber depending on the downstream analysis to be performed. “Previous technology relied upon enumeration,” Crouse notes, “but we believe that the clinical power of CTCs depends on characterization.” In other words: characterize the cell, understand the underlying cancer biology. The VTX-1 system accepts blood samples that are introduced via a blood tube that is attached to a self-contained, one-time-use cartridge. In the cartridge, blood is automatically diluted and processed. 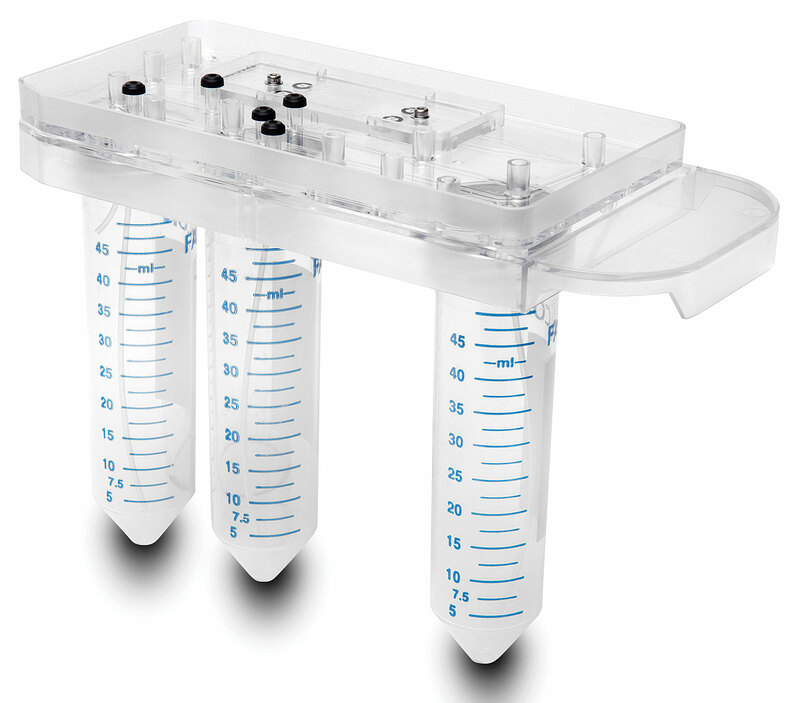 Captured CTCs may be collected into an Eppendorf tube, a Petri dish, a slide chamber, or a microwell strip. Crouse says the Vortex approach is a “best-in-class solution for isolating CTCs from whole blood. We’re working to pair this with the right analytical technology,” to create an end-to-end solution. Currently, Vortex is partnering with diagnostic and research companies to expand available assays to, for example, include molecular tests or protein expression analysis. “Our typical research customers are major cancer centers. They have clinicians who, for instance, want to culture cells and create mouse xenograft models,” he says. Typical quests involve determining the number of CTCs in blood samples from stage III/IV metastatic cancer patients, growing intact tumor cells, or developing RNA expression profiles from CTCs. “We have a range of protocols for working with rare cells as a starting point for molecular tests, protein expression analysis, CTC enumeration, etc., to support cutting edge research,” Crouse details. The VTX-1 system can be introduced to diagnostics laboratories without changing their workflows. 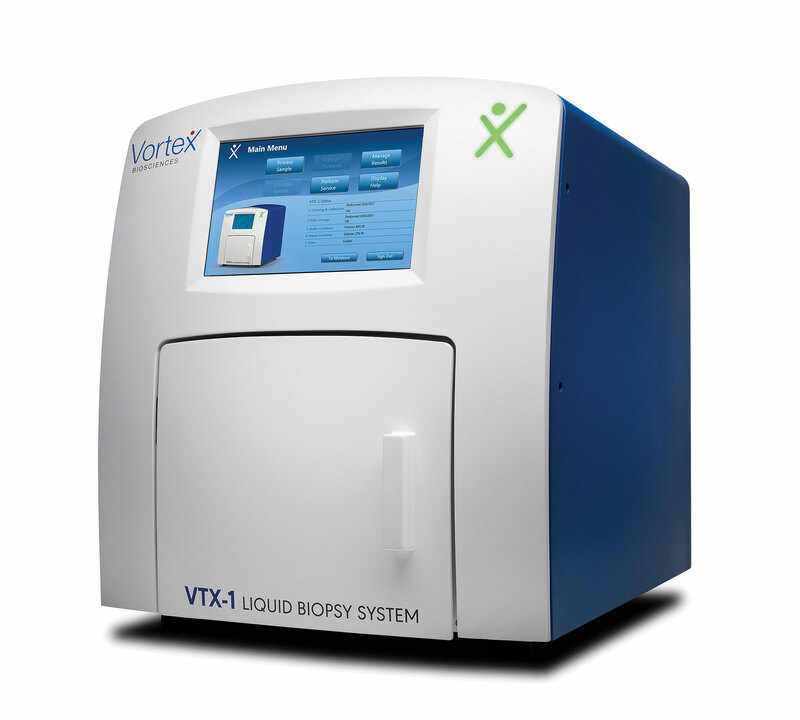 According to Vortex literature, a laboratory may simply attach a blood tube into the Vortex cartridge, slide the cartridge into the VTX-1, enter basic sample information, and hit “Go.” Purified CTCs are available within one hour. 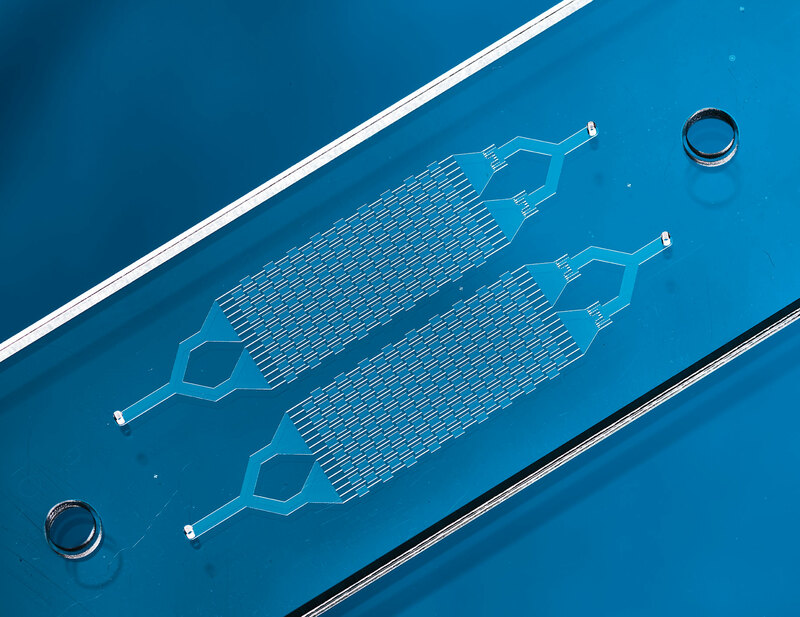 The VTX-1 is built around a microfluidic chip that isolates CTCs directly from whole blood.The isolation process, which relies on laminar microscale vortices, is label-free and contact-free, keeping CTCs intact and viable. Once isolated, the CTCs are released in a 300-µL volume for collection and downstream analysis, giving reserachers direct access to undisturbed cancer biology. For users, one of the greatest challenges in working with the VTX-1 is working with rare cells. “Numbers of CTCs range from low single digits to a couple hundred cells in a blood tube,” Crouse indicates. Specifically, concentrations of CTCs may be as low as one cell per mL, although white blood cells may be numbered in the millions. “These cell numbers are lower than most researchers are accustomed to working with,” Crouse continues. “They need, therefore, information about optimizing protocols for working with low quantities of DNA, RNA, and protein input.” While the CTC isolation is incredibly simple, characterizing the CTC biology is the area, he says, where customers are most likely to require help. Vortex was founded in 2012 based on work conducted by the laboratory of Dino DiCarlo, Ph.D., at the University of California, Los Angeles. “At that time, there wasn’t a good solution for isolating CTCs without bias, in a way that allowed the CTCs to be characterized and analyzed, and pushed out to hospitals,” Crouse recalls. “The technology our co-founder, Elodie Sollier, Ph.D., was developing proved very powerful and robust.” But to be practical in the clinic, this technology needed to be optimized around an easy-to-use, fully automated platform. Vortex worked on the early development platform until late 2014. Then the company optimized the platform, creating the VTX-1 product, which was first sold in 2017. “Finding customers who have a strong interest in recognizing the power of CTCs is fairly easy,” insists Crouse. He admits, however, that demonstrating the power of CTCs is a bit more challenging: “We’re still working to demonstrate true clinical utility with CTCs and to show how powerful it can be to isolate tumor cells from whole blood rather than from a tissue biopsy.” Demonstrating that utility is where much of Vortex’s efforts are directed. Results that demonstrate utility are beginning to accumulate, and clinical studies are ongoing. One involves PD-L1, a protein on the surface of cancer cells that inhibits the immune system from attacking those cells. Immunotherapy drugs targeting that protein have proven to be effective against certain cancers. The current companion diagnostic measures PD-L1 expression on tumor biopsies, but Vortex believes that measuring expression on CTCs can offer more clinical value as it enables the monitoring of the cancer over time in a cost-effective, low-risk manner. Vortex developed an assay that allows researchers to assess the presence of PD-L1 on CTC surfaces. The assay can be used to perform initial diagnoses and to monitor changes in PD-L1 expression during treatment, thus leading to more targeted therapeutic treatment. Additional studies published in the past year in peer-reviewed journals (including npj Genomic Medicine and Nature Precision Oncology) have demonstrated, for example, the utility of the VTX-1 in isolating CTCs for next-generation sequencing, as well as in accomplishing the label-free isolation of CTCs in prostate cancer patients. These advances enable deeper understanding of patients’ cancers and their evolution in real time, which allows more accurate diagnoses and prognoses. Vortex Biosciences’ VTX-1 Liquid Biopsy System is designed to automatically isolate intact CTCs directly from whole blood with high recovery and high purity. The system, which does not require that blood samples be preprocessed, typically collects CTCs with fewer than 100 contaminating white blood cells per mL of sample processed, which means fewer than 1,000 white blood cells in a 10-mL blood tube. Focus: Vortex Biosciences has developed a fully automated, label-free platform to isolate circulating tumor cells from whole blood.